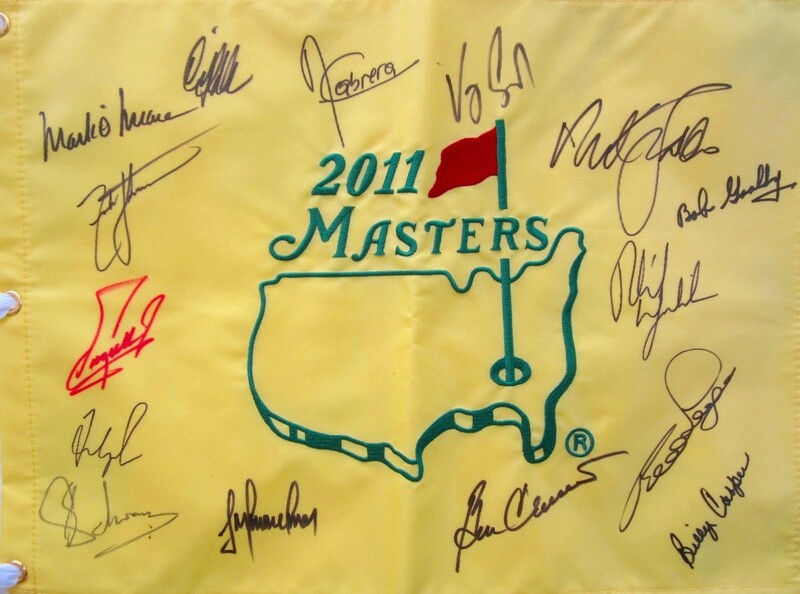 2011 Masters golf pin flag autographed by 15 winners of the green jacket: Angel Cabrera, Billy Casper (deceased), Fred Couples, Ben Crenshaw, Nick Faldo, Bob Goalby, Trevor Immelman, Zach Johnson, Bernhard Langer, Phil Mickelson, Mark O'Meara, 2011 winner Charl Schwartzel, Vijay Singh, Craig Stadler and Fuzzy Zoeller. 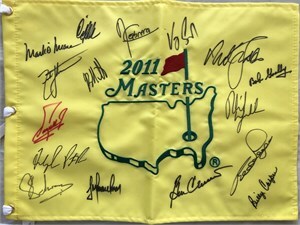 Obtained in person at various Southern California PGA Tour events. With certificate of authenticity from AutographsForSale.com. ONLY ONE AVAILABLE FOR SALE.